Home Unlabelled Organize your Photos! I'll admit it. I had over 1,200 photos in my photo library on my iPhone. I was one dropped iPhone away from losing a whole lot of great family memories. My seventh grade daughter brought this obvious fact to my attention. "What would you do if you lost all of those photos?" Do you find yourself fighting the same battle with all your photos? I knew I had to do something to get my photos more organized. I didn't like going through and having to tap on photos to upload them to a folder in Google Drive or Flickr. I thought that there had to be a better way, and there was. I found out about it from the awesome Josh Allen. 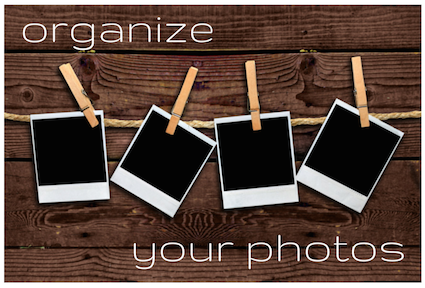 Here's a simple solution to organizing those priceless family photos as you take them on your phone! I created an IFTTT (If This Then That) account. What is IFTTT? It's a simple automation that allows you to select two services. When you use one service, you trigger the next service and an action takes place. Just check it out. Trust me, you'll love it! I'm not going to go into detail here as it would be a whole other blog post. Here is a recipe that someone had already made, so I set it up to work with my personal accounts. I post a family photo to my Instagram account. In the body of the post, I am sure to include the hashtag "#colonyb" (colony Badura) that I created for our family. This will trigger the "then" portion. I chose my "then" to be Flickr. I wanted my photos to all end up in one place. Flickr offers you 1TB of storage for free, so my one place ended up being Flickr. You can now create and order hardbound memory books in Flickr, so I am super excited to create my first one this year for Christmas from all of the family pictures I have posted using this IFTTT recipe. Every single time I post a picture to my Instagram account using our family hashtag, that picture is automatically uploaded to my Flickr account! No more going through my photo library and uploading photos! I just do it all with one simple recipe in IFTTT. Check it out! There are a ton of different ways to utilize IFTT. You can create a recipe to save all of your favorited Tweets to a Google Spreadsheet, save any new photo you take on an iOS device to a spreadsheet, keep all the photos you upload to Facebook in one safe place or better yet, create a customized one!